Michael Gaster, pictured with the Roland M-5000 OHRCA Live Mixing Console. Photo courtesy of Michael Gaster. © 2015. Los Angeles, CA, December 1, 2015 — Savannah, Georgia-based live sound and production consultancy Michael Gaster and Associates, led by its namesake, has carved out a unique niche among audio professionals. Beyond the wide breadth of services the firm offers – everything from design and build to front-of-house mixing and other support – Gaster has some unique specialties, most notably live sound for orchestras and large ensembles with high channel counts. “I’ve done touring with rock bands and all sorts of gigs like that, but as early as the mid-90s, I was finding success mixing large orchestral events,” recalls Gaster. He and his firm now work with such ensembles as Charleston Symphony Orchestra, the Savannah Philharmonic Chorus & Orchestra, the Hilton Head Symphony Orchestra and others. On a recent performance with the Savannah Philharmonic, Gaster employed the Roland M-5000 OHRCA Live Mixing Console for a high-stakes public outdoor event (“Picnic in the Park”) with no sound check. To Gaster’s delight, the M-5000 helped him do his job flawlessly, and he has been raving about the console ever since and is planning on using the M-5000 for many more events in the future – both in the worlds of orchestral music and with more mainstream pop and rock acts. 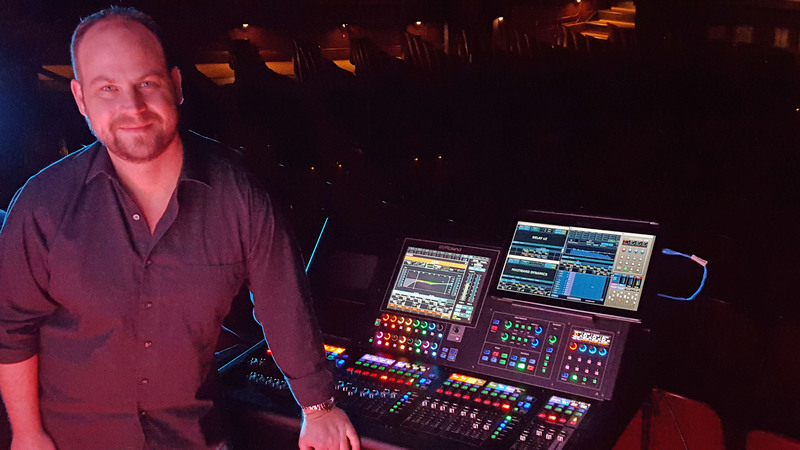 Photo caption: Michael Gaster, pictured with the Roland M-5000 OHRCA Live Mixing Console. Photo courtesy of Michael Gaster. © 2015.